Politics is the art of the possible, according to 19th century Prussian statesman and diplomatic genius Otto von Bismarck. You may not know it but it is also possible to get involved in political betting with BetStars. Think you know who will be the next leaders of the Conservative and Labour Parties or the next US president? Take a look at our odds and see if you have your finger on the pulse of the nation! Brexit betting and next General Election odds: Who will win the big vote? MPs will vote this week whether to accept or reject Theresa May's Brexit withdrawal agreement from the European Union. 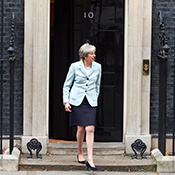 The Prime Minister's plan has been accepted by her Cabinet - although not without the resignation of Brexit Secretary Dominic Raab - and the EU, but the crucial test comes on Tuesday when the House of Commons gets to decide on the United Kingdom's exit from Europe.